Options are a bet on where stocks won't go, not where they will go. Options provide a statistical edge, unlike stocks which boil down to a binary event or a 50:50 probability of success. Options enable traders to generate consistent income, mitigate risk and circumvent market volatility. I was able to win 87% of my trades during the Q4 2018 bear market through the Q1 2019 bull market. 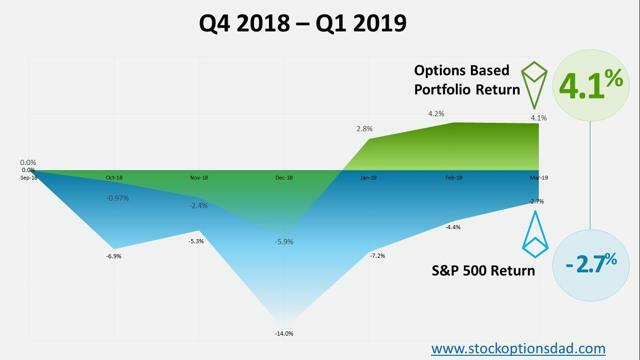 My options-based portfolio resulted in a total portfolio return of 4.2% against the S&P 500 return of -2.7% over the previous two quarters. Options provide a statistical edge, unlike stocks which boil down to a binary event or a 50:50 probability of success. One can be wrong about the direction of a stock and still be profitable because options are a bet on where stocks wont’ go, not where they will go. Options enable traders to generate consistent income, mitigate risk and circumvent market volatility. Since options provide an edge that places the odds of success in your favor, high-probability options trading thrives regardless of market backdrop. In this article, I’ll show empirically how I was able to win 87% of my trades during the Q4 2018 bear market through the Q1 2019 bull market. In Q4 2018, the S&P 500 sold off 14% and erased all of its gains for the year. The start to 2019 posted its best first quarter since 1998 with a return of 13.1%. My options-based portfolio resulted in a total portfolio return of 4.17% against the S&P 500 return of -2.7% over the previous two quarters. This timeframe provided both bear and bull market conditions to demonstrate the effectiveness and resiliency of options trading while outperforming the broader index by a wide margin. 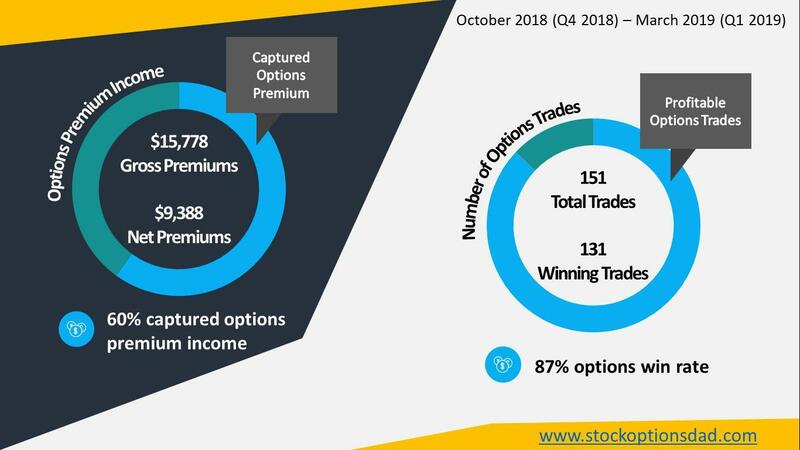 In Q4 2018, during the bear market, I was able to achieve a 79% options success rate by closing 66 out of 84 option contracts for wins. In Q1, during the bull market, I was able to achieve a 97% options success rate by closing 65 out of 67 option contracts for wins. Taken together, options provide a margin of safety and a statistical edge, enabling your portfolio to mitigate risk, provide consistent income and hedge against market volatility. Option trading is effective in managing portfolio risk as you determine your success rate. If you want to be successful in 70%, 80% or even 90% of your trades, options trading enables you to select your level of success over the long-term. Risk mitigation is particularly important for smooth and consistent portfolio gains while circumventing market wide melt-downs such as that in Q4 of 2018. Maintaining cash on hand to engage in covered put option selling is a great way to collect monthly income via premium selling. Conversely, selling covered calls on long-term or assigned stock positions is a great way to lower cost basis and generate consistent income as well. Focusing on implied volatility rank, one can optimize option selling to yield a high probability win rate over the long term given enough trade occurrences. In the end, options are a bet on where the stock won’t go, not where it will go and collecting premium income throughout the process. These empirical data demonstrate that the probabilities play out given enough occurrences over time regardless of market condition. Over the past two quarters, out of 151 trades, an 87% success rate was achieved while outperforming the broader market by a wide spread S&P -2.7% vs. 4.17% (Figures 1 and 2). A wide array of options in different sectors with different expiration dates will ensure portfolio diversity and plenty of opportunities to take profits. I traded 62 different tickers that included stocks and ETFs while being agnostic to any particular sector or underlying stock (Table 1). Over the past 6 months, my longest winning streak was 50 trades, my average contract length was ~10 trading days and my average income per trade was $67 (Figure 3). 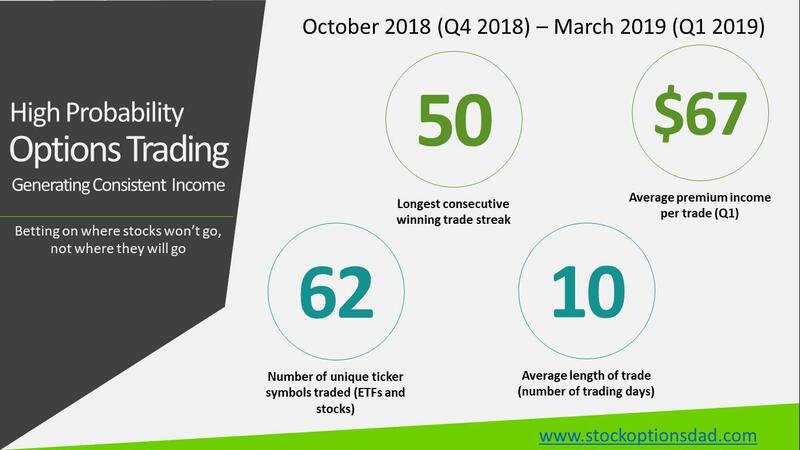 Out of 151 trades in a period where the market witnessed both bear and bull market scenarios, an 87% win-rate was achieved while outperforming the broader market by a wide margin (Figure 4). Accounting for all the contract income, assigned underlying positions that were relinquished at a profit and unrealized losses (total portfolio) yielded a return of 4.17% while the broader S&P 500 posted a return of -2.7% (Q4 2018 through Q1 2019). The main keys for option trading success are leveraging implied volatility rank and time premium decay. Markets predict how volatile stocks will be into the future via implied volatility. Implied volatility (IV) is the expected volatility of a stock over the lifecycle of the option contract. IV is influenced by supply and demand of the underlying options and by the market’s prediction of share price movement. As the expectations rise and demand for the options increase, IV will rise. Historically, this predicted volatility always overestimates actual volatility and it’s this overestimation that can be exploited to the benefit to option sellers. This is where IV Rank comes into play and how this is the most critical variable in options trading and its success. IV Rank is a measure of current implied volatility against the historical implied volatility range (IV low – IV high) over a one-year period. Let’s say the IV range is 30-60 over the past year, thus the lowest IV value is 30 and the highest IV value is 60. We need to compare the current IV value to this range to understand how the current IV ranks in relation to its historical IV range. If the current IV value is 45, then this would equate to an IV Rank of 50% since it falls in middle of this range. Alternatively, if the current IV value is 55 then the IV Rank is 83%. When IV Rank approaches a value of greater than 50% then option sellers can use this to their advantage to take in rich options premium with the expectation that this implied volatility will decrease. Any value above the 50% threshold is where the overestimation of actual volatility thrives. Selling options in these high IV Rank situations serves as a two-fold benefit since time premium is always decaying and IV will likely revert to its mean and fall. Even if the stock moves up, down or trades sideways without breaking through the strike, the option will be profitable as time and IV fall. The high IV Rank provides rich premium and as the option lifecycle unfolds and this volatility decreases, the option time value impoldes and the option decreases in value allowing profits to be realized earlier in the life cycle without waiting until expiration of the contract. All data presented account for commissions/fees thus all numbers are final net values after backing out trading fees. Sticking to the mechanics of selling option premium with high IV rank with a strike price 1 standard deviation out-of-the-money, an expected ~85% probability of success over the long-term given enough trade occurrences plays out. As volatility decreases in conjunction with time decay, the option contract will decrease in value providing the option seller with the potential for realized gains early in the option lifecycle. Taken together, this translates into high probability options trading to maximize option outcomes regardless of directionality and market backdrop. Despite the bear and bull market scenarios over this 6-month timeframe, I was able to outperform the S&P 500 by a healthy margin (4.17% verses -2.7%). This seesaw of a market provided a true test to the high probability trading and durability of this options trading method and yielded an 87% success rate. These empirical data demonstrate that the probabilities play out given enough occurrences over time with varying market backdrops. Options are a bet on where stocks won’t go, not where they will go while generating consistent income and mitigating risk. Disclosure: I am/we are long GE, BAC. I wrote this article myself, and it expresses my own opinions. I am not receiving compensation for it (other than from Seeking Alpha). I have no business relationship with any company whose stock is mentioned in this article. Additional disclosure: Disclosure: The author holds shares of GE, USO, BAC, C, CVS, SLB and AAL via option assignment and may engage in option selling in any of the mentioned underlying stocks or ETFs. The author has no business relationship with any companies mentioned in this article. He is not a professional financial advisor or tax professional. This article reflects his own opinions. This article is not intended to be a recommendation to buy or sell any stock or ETF mentioned. Kiedrowski is an individual investor who analyzes investment strategies and disseminates analyses. Kiedrowski encourages all investors to conduct their own research and due diligence prior to investing. Please feel free to comment and provide feedback, the author values all responses. The author is the founder of www.stockoptionsdad.com where options are a bet on where stocks won’t go, not where they will. Where high probability options trading for consistent income and risk mitigation thrives in both bull and bear markets.